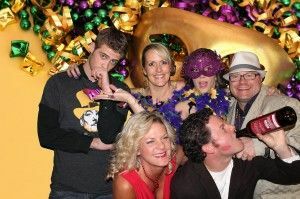 Mardi Gras - Let the Good Times Roll! TapSnap captures great photos of the spirit of Mardi Gras. Just like Christmas is more than Santa and eggnog, Mardi Gras is more than beads and bourbon; it has a distinct history that's deeply rooted in heritage and culture. It's wild! It's carefree! And it's a ton of fun! Mardi Gras marks a day of celebration, feasting, and (over)indulgence. Literally translating to Fat Tuesday in English, Mardi Gras is the last day to enjoy rich foods, alcohol, dancing, and (potential) debauchery before the much more conservative period of Lent, which starts the following day on Ash Wednesday. Celebrating Mardi Gras involves donning a costume or disguise, including une masque (a mask) adorned with les perles (beads), les plumes (feathers), or les paillettes (sequins) and attending boisterous parades and parties where guests get les babioles (trinkets). If you haven't guessed it already, Mardi Gras has French Christian roots. This is exactly why the most exorbitant Mardis Gras celebrations in the USA take place in traditionally ethnic French regions, like New Orleans. Capturing the very essence of Mardi Gras, the saying Laissez les bons temps rouler! reminds us to Let the good times roll! If you're celebrating Mardi Gras this year (and, really, why wouldn't you), make sure you get dressed up, let your hair down, eat and drink to your heart's content, and forget about your troubles. Oh! And take lots of pictures. TapSnap is perfect for capturing creative costumes and crazy moments!